What an incredible privilege for Dogstudio, Belgian agency made of 23 digital-lovers, to help shape the future of the largest science museum in the Western Hemisphere. Our team is all about crafting tailor-made digital experiences, and it is vital for us to constantly evolve and push our boundaries. This contract with The Museum of Science and Industry Chicago (MSI) allowed us to set foot in the museum market, which was yet to be explored by our agency. Let’s also face it – collaborating with the only U.S. museum that has a real German U-boat – does it get any cooler than that? We really appreciated our collaboration with MSI’s Digital Media Staff, and were very blessed to handle the complete revamping of the website’s User Experience (UX) and design (UI) with a talented team that shares our enthusiasm for innovative digital communication. MSI welcomes more than a million guests each year, but in our digital era, the potential audience available to the museum is far greater—as is competition for their time. 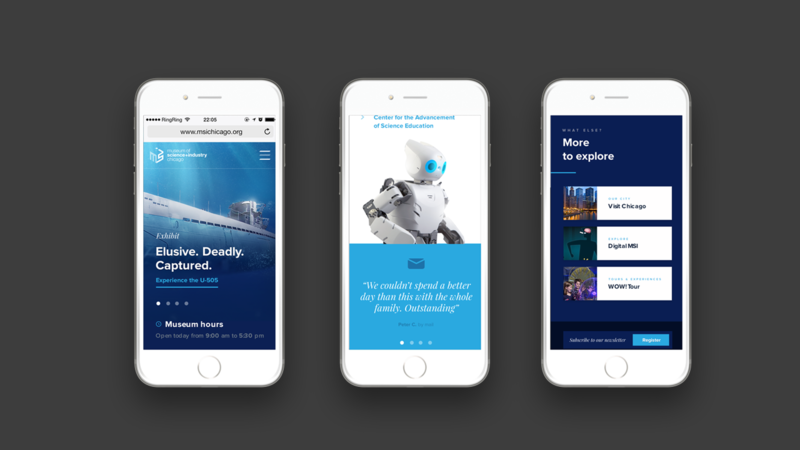 Developing digital platforms is crucial to engaging potential visitors and inspiring future scientists, and that’s when we jumped in to develop a creatively re-conceived digital strategy for the American museum, and to remodel their website design and usability.